Now I'm consistently doing 5 times the profits I had [ a few months ago ] but I'm also so much happier. - Catherine R.
From an (unsolicited) email referral that my client wrote. From a post that a client made in my Facebook group! Last week was the most lucrative week I've had in six years and I think I'm gonna do better this week . . . And it was EASY! - Krister L.
You help me see what I am seeking. You helped me recognize and honor the relationship between my business and my soulful desires as an entrepreneur. And you helped me navigate a bad situation with my boyfriend. And I love you for all those things :) - Adrienne G.
If we had never done this program together I wouldn't have conquered my fear . . . I feel SO empowered and feel like I'm on the path to a MUCH better place, a solid foundation is forming for all the great things to come! So funny the program is for business but it's been a complete soul/body/mind healing as well! - Megan M.
I am happier than I have ever been, leading a life full of rest, joy, and leaning back into the arms of the universe to provide for me. - Amanda J.
Marley is such a magical woman! I have had many Reiki sessions with her and they have all been very powerful! The intuitive insights she receives during the sessions are always spot on and combined with her wisdom filed guidance and advice I always feel more confident and empowered. She has been such an invaluable tool in my awakening and healing journey! I can't wait to work with her more in the future! - Laura L.
From my very first encounters with Marley, parts of me felt comforted, held, validated, and heard . . . Her reading was informative, gentle, and intuitive beyond measure. It brought to my awareness layers of memories and experiences that filter my daily life but ones that I'd forgotten make up integral parts of me. Her reading spoke truth and light into parts of me that needed healing, and when I began to feel any sort of fear or panic about these areas that needed attention, her wise and intuitive voice spoke stillness and healing. I knew she had began my healing; I knew she would help me heal in ways I'd never imagined. As this process continues to unfold for me, I recognize this reading and connection with Marley as a pivotal moment in my life, one that will forever change me. And for that, I am grateful, grateful, grateful. - Kristen J.
Marley's kind and soothing voice guided me through the most wonderful mediation. I felt safe in the space that Marley held for the release of emotion that I needed in our session together. Our meditation brought me to a memory that I had long forgotten that was ready to be felt and released. Although our session was held over Zoom, I could feel the comfort of Marley's energy in the room with me. Marley also checked on me the next day after our session, which isn't something you find with every coach. I can tell that Marley genuinely cares abut each person she works with, and that is so beautiful! - Samantha D.
Marley is a talented practitioner and, quite simply, a warm, compassionate, and lovely spirit. I am grateful to know her and to have benefited from her talents. - Ali D.
I have so much to say about Marley - a beautiful soul, caring, grounding, connected and compassionate. - Nicole B.
Marley's coaching style is warm, supportive and practical. She effortlessly guided me to some important topics to address, and provided the space in which to authentically explore them. - Daniele I. Me: What are you celebrating that's gotten easier? This reading ended up catalyzing one of the biggest shifts I have ever experienced – my spiritual awakening. 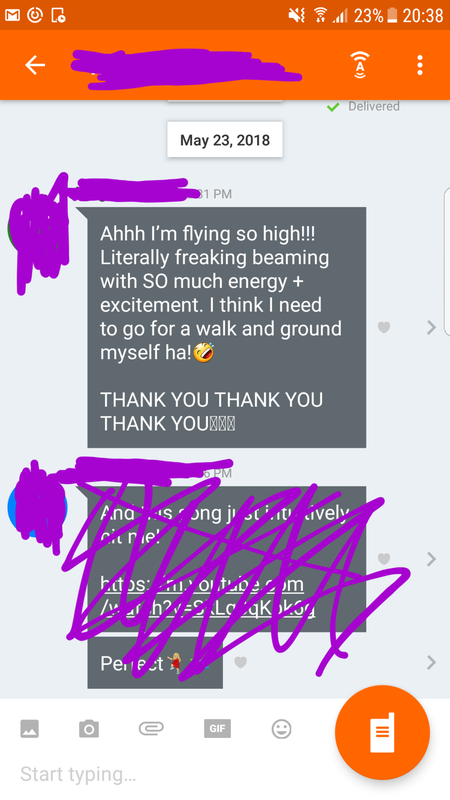 I am beyond grateful, thankful, and happy that I am living in a completely different way, and that I am a completely different person than I was 4 months ago! Marley’s style of coaching also was so helpful. - Amanda J. Are you ready to have your own success story? ?